When my usual facial cleanser was running low, I decided to try something new. My skin can be a little sensitive and dry, so I decided to give the Almay Makeup Remover + Cream Cleanser a try. I didn't read the instructions at first, so I tried to use it in the shower, as I normally would do with my usual cleanser. I was surprised to find that this one didn't lather and seemed to leave a coating on my skin when used that way. Definitely not what I had expected. In the evening, I decided to read the instructions (duh) and to try it again. This product is less like a “soapy” cleanser, and much more similar to the old fashioned cold cream that I used as a teenager to remove makeup. You apply it onto a damp face with dry fingers or onto a dry face with damp fingers (my preference), then you wipe it off with a damp washcloth. It is a really gentle cleanser that is great at removing makeup—even the 24 hour lip color that I prefer that isn't usually very washable! It's an extra (or slightly different) step in my skincare routine, but I like the way that it makes my skin feel soft and clean. My husband likes the fact that he doesn't wake up next to a “raccoon lady” because I hadn't removed my makeup properly the night before. Another pro: it doesn't contain micro beads to get into my eyes (it can be hard to find a cleanser without them these days). I'm sold on this product, and I plan to keep using it. The Almay makeup remover and cleanser is a great addition to my vanity and makeup routine. I was amazed by how easy and effortlessly this cleanser removed my makeup! Even removed that stubborn eye makeup that doesn't come off easily! The cleanser also left my face feeling clean and free of makeup and any residue. It doesn't leave your face with that harsh over dry feeling like some makeup removers do. And with the price, you seriously cannot go wrong! I am definitely adding this to my daily routine. I cannot say enough good things about this product, and I highly recommend it to anyone, even those of you with sensitive skin. I wanted to try something new and got it with this product. My impressions of this product are on point. This product doesn't feel over drying like some do. This one is the opposite. You only need to dispense a pea size to clean face without no worries. My skin felt moisturized and soft after first use. It didn't seem to have any harsh ingredients or alcohol added to it. I will definitely use this product every time. This product should be used along with towelettes to feel even more refreshed after cleaning face. I'm glad Spark program offered this product, I would've never known about it. This is a very nice make-up remover and cream cleansing product from Almay. I have combination skin and I didn't have any issues with this cream cleanser. I like how easy it is to dispense, the creamy feel and that it's unscented. 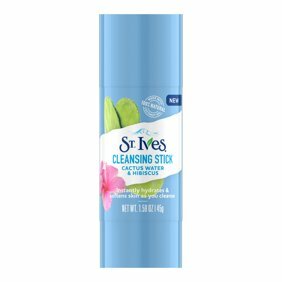 It gently removes makeup and leaves my skin soft, clean and conditioned. I don't use waterproof products but it does state it will remove waterproof makeup. I gently massage the cleanser onto my skin, rinse off with water and pat dry. The directions state that you can wipe off with a wet wash cloth and rinse off with water if desired. It's hypoallergenic, dermatologist tested, ophthalmologist tested, safe for sensitive skin, won't clog pores and it's fragrance free. It has 4.5 fI.oz of product so it will last me awhile. I will certainly continue to use this product from Almay as this is one of my new favorite products. I've been using the Almay Makeup Remover and Cream Cleanser now and I think it does a great job removing tough waterproof long wearing makeup. It is effortless! You don't have to scrub your face hard. The Almay Makeup Remover and Cream Cleanser lifts the makeup using a lightweight formula. After each use, my face feels very soft, really clean and deeply conditioned. It's not just for makeup, it also removes dirt and oil. It works great on oily and sensitive skin too. I would definitely recommend this product.